We've all experienced some type of skin challenges that send us running to the cabinet for that bottle of our favorite essential oil. Whether its lavender or rose oil, sandalwood or frankincense, there's an essential oil in your space to treat one or more of your skin challenges. Essential oils are the life force or the very "soul" of a plant. Each drop contains the plant hormones and organic chemical compounds that regenerate and give oxygen to your skin. Most essential oils are steam distilled from flowers, roots, barks, leaves, resins or twigs and pressed from citrus rinds. With your skin being the largest organ of your body, it's all too important that you are very conscious of what you put on your skin. Your skin takes in and eliminates and is a major part of your immune system. It protects you from the elements and prevents harmful chemicals from entering your body. Essential oils act as transporters that carry therapeutic benefits to the layers of your skin. They also improve your skin's condition by increasing your bloods circulation. You can use essential oils as part of your daily black skin care regimen. Given the right oil for your skin type, it can act as your moisturizer or toner for your skin. Essential oils are used in the complimentary or alternative healing form of Aromatherapy. Therefore you might want to consult with a Medical Doctor that understands and appreciates the use of Aromatherapy in the form of a healing aid. What can essential oils do for your beautiful black skin and what is the benefit of using them? Essential oils can penetrate the layers of your skin all the way down to the dermal layer. This is where new cells are formed. Essential oils affect your emotional and mental state in a positive way, therefore, they can alleviate stress related skin problems. Essential oils can stimulate and regenerate the production of healthy skin cells following burns, sun damage and in healing your wounds. Essential oils soothe sensitive and inflamed skin. Essential oils contain plant hormones that help balance and remove hormonally related skin problems. Essential oils are highly concentrated and must be used with caution. You must test each oil before you use it for potential allergic reactions. Try this: Add 1 to 2 drops of essential oil to 1 teaspoon of base oil in a small bowl. Place a dab on your inner wrist, inside your upper arm, behind your ear or knee and wait for 12 to 24 hours. If you have no irritation, then this essential oil can be considered safe for you. Note: A base/carrier oil is an oil that blends well with an essential oil and dilutes the essential oil that it may be skin ready. A good choice of base/carrier oil is, avocado, hazelnut, jojoba and extra virgin olive oil. These oils have great shelf life, do not become rancid and are great for your skin. When considering oils for your beautiful black skin, Essential oils in their purest form known as hydrosols or floral water are a great choice. Hydrosols are a pure, natural by product of the essential oil distillation process. These fragrant waters are saturated with the water-soluble compounds present in the plants and they are gentle enough to use on your skin. Floral waters are the easiest way to use essential oils on your skin. These waters have healing properties of the oils and are very good for sensitive skin. Hydrosols are great as toners, splashes and sprays that are soothing, hydrating, and lightly moisturizing to your skin. Lavender, Chamomile (German), Neroli or Orange Blossom and Rose Otto are at the top of the list when considering hydrosols for black skin. Lavender is an essential oil that can be applied directly to your skin for most people. It's an exceptional oil for treating surface burns on your skin. You know the ones you get from flat irons and regular irons. 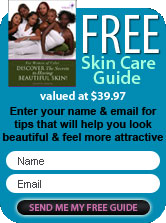 Black skin care is an area in the skin care industry that warrants a bit of attention. As a large percentage of the buying population of skin care products, finding the right product that's been specifically designed with you in mind is a welcomed site.